I had a couple of free hours last week and so I dropped in to our 'antique row' on the south side of town. 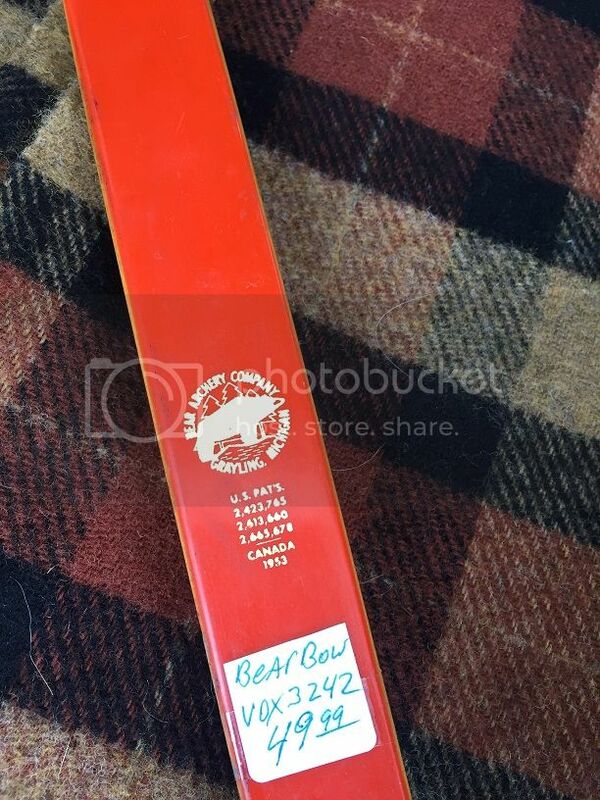 I'm not a collector but occasionally find an interesting fountain pen or an old hunting magazine for cheap. It's more the hunt than the finding, as I'm sure most of you can relate to. Anyway, it's about 3 minutes until I have to go pick up my boy from school and I turn the corner and there, stuck in the corner was this good-looking Alaskan. Grip and shelves are in great shape. A few linear stress cracks on the back and belly is all I can see. Tips are pristine. 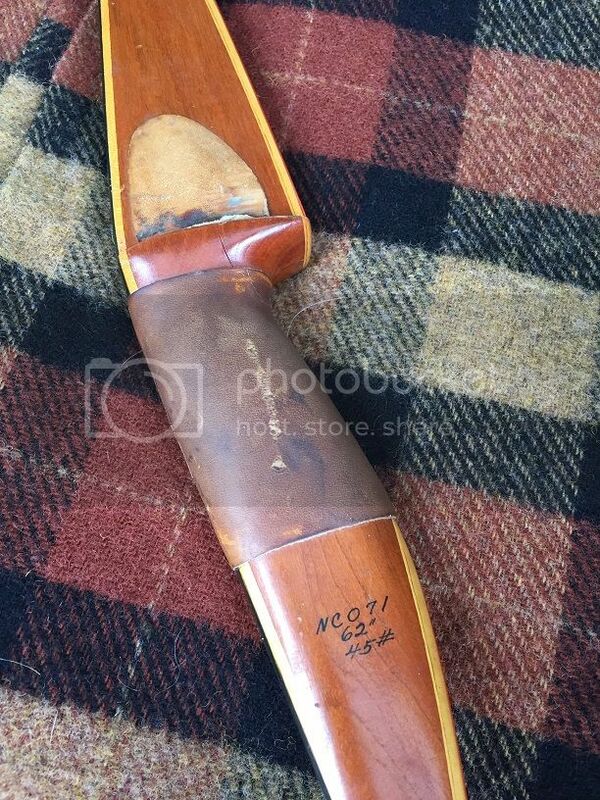 As you can see however, there is a crack running just below the shelves down underneath the leather grip. 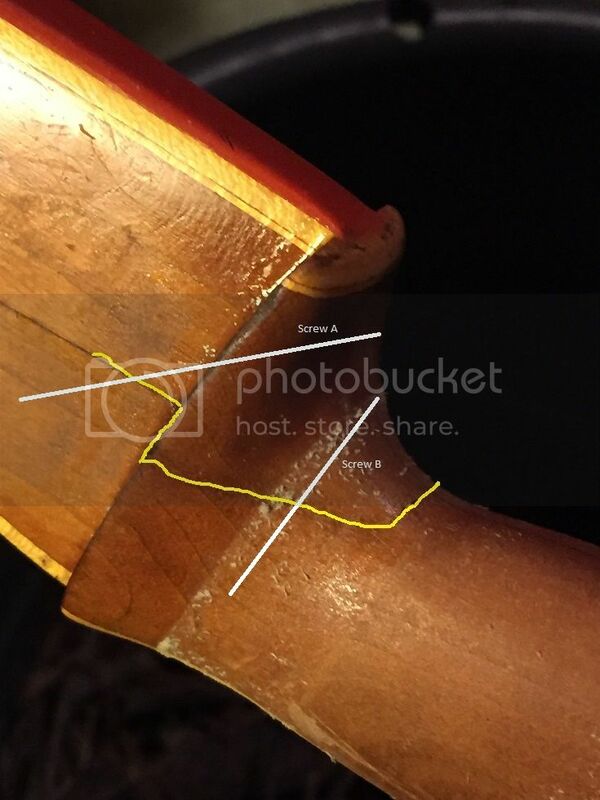 The crack is present on both sides but doesn't appear to extend below the grip...stopping somewhere in the middle. I don't have much in this bow. (That 49.99 price tag was before the 10% holiday discount. :-) ) I'm assuming this is repairable? Remove the grip, blow out the crack, glue and clamp? 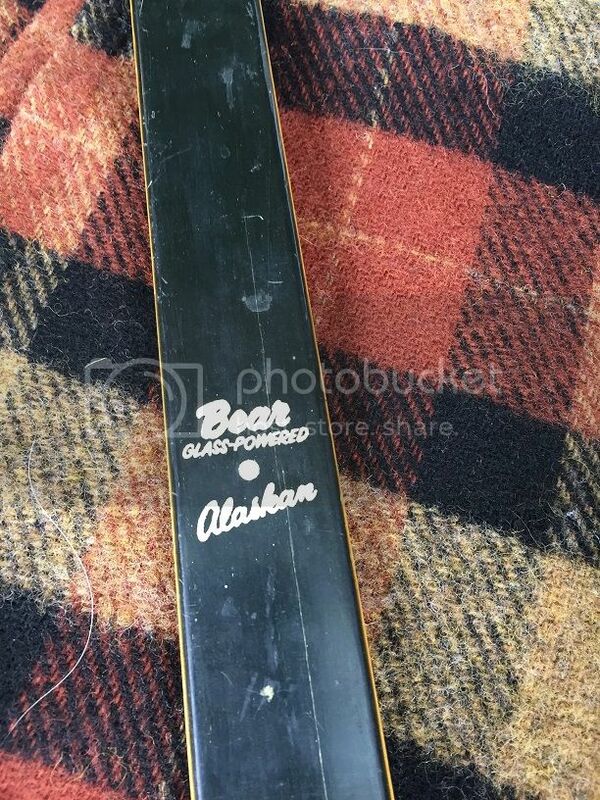 Re: Nice Bear Alaskan, with a repair question. I think that I would take off the backplates also just to be sure there isn't some cracking going up the sight windows. It is troubling that the crack is on both sides. You have the right idea about gluing and clamping. It will probably take quite a lot of Loctite 420 to fill that crack. Use a syringe and get it into the middle and all the way out, then clamp and cure. Go back the next day and see if more glue will wick into the crack. 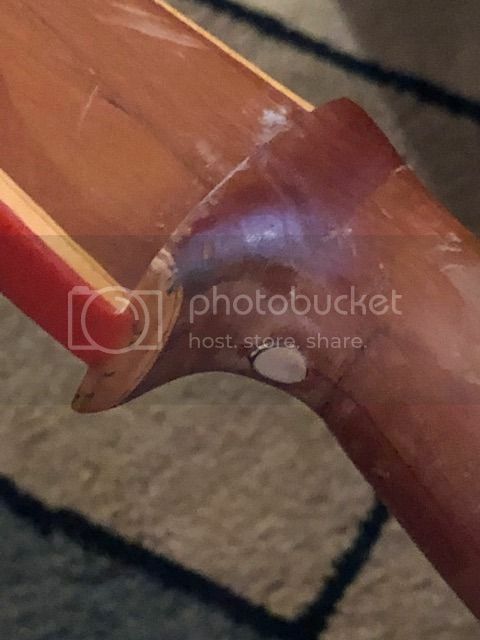 I probably would drill one or maybe two 1/4" holes about an inch deep under the leather grip and glue in some hardwood dowels to reinforce the repair. Since all the leather will be off, take a half hour to sand the riser and then put a few coats of Truoil on it. It should be a good looking solid bow when you finish, and the repairs are pretty easy. Thanks Brad. Good idea on the dowel reinforcements. I think Brad is on point. That crack is troubling but probably not a deal-breaker if you can get plenty of Loctite 420 into it. 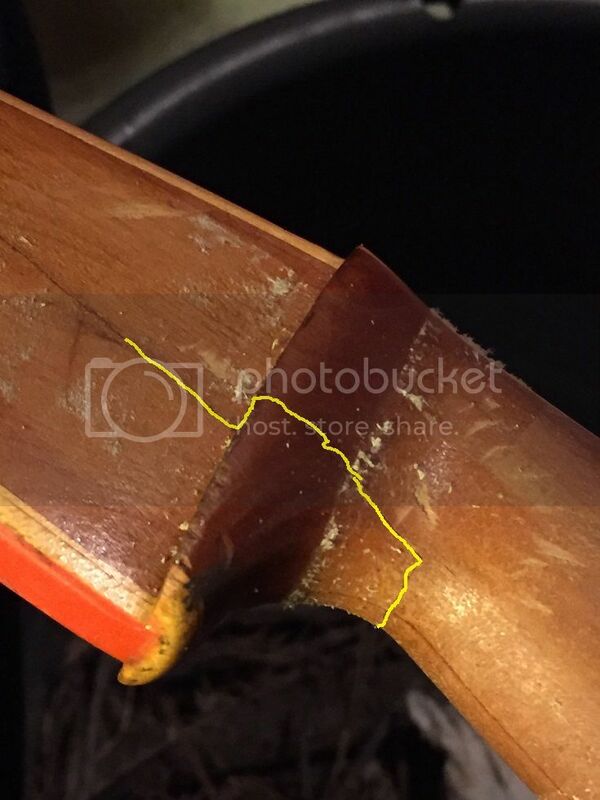 Given that the crack appears to go all the way through part of the riser and shelf extending up from the grip, perhaps even beyond the shelf, the load on the bow under tension ought to compress that crack. I wonder if a steel cabinet screw, inserted from the back (as opposed to the belly) and angling up through the crack in compression at about a 22.5 angle would give greater strength than a wood dowel. 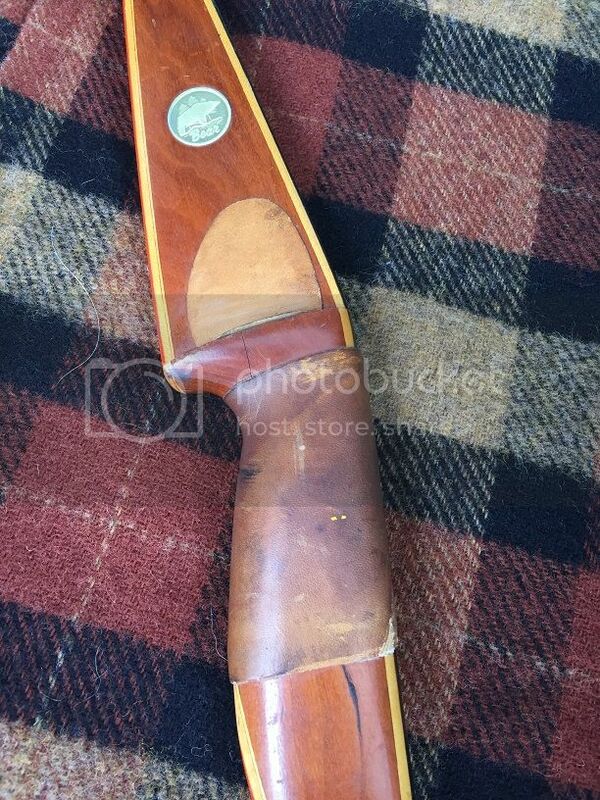 The screw head could be counter-sunk and would be covered over by the new leather grip. An interesting idea on the screw. My thought is that a wood dowel will flex whereas a metal screw won't. Since the bow experiences stress across it's entire body I wonder if having a non-flexible screw in it might do damage under stress? Not a physicist or a bowyer, just trying to think it through. What's your thinking behind the 22.5 degree angle? Well folks, the verdict might be in. When strung this crack will be under compression as Mangonboat said so I'm toying with the idea of putting a dowel or screw in it, Loctite-ing the thing up and then giving it a try. Here's where I'd put the dowel or screw(s). If it blows up I can always just glue it together as a wall-hanger or pry out that coin for use in another bow. That sounds like a pretty good plan. The coin is worth about half the cost of the bow. You really don't have much at stake here. A very fair point. I'll give it a try and report on the results. Thanks for your help gents. Much appreciated. Wow, just browsing in the archives past page 1 and saw that I never closed out this repair thread. Ended up drilling and putting a hardwood dowel in along with a fair amount of Loctite. Been shooting it for about 2 years now, off and on and it seems to have held up well. Here's a picture right after the repair was complete. It really helped that the crack was on the compression side of the bow. No doubt caused by someone stringing it backwards and pulling back like Geronimo. Thanks for following up. Looks great, now, and I'm not surprised at how its holding up. I have repaired two with that crack upward through the grip up into the shelf and and always wondered how it could have happened. One is a big Fasco Decathalon that also had the base of a stabilzer rod broke off in the bushing and dings on the outside corners of the "horns" on the left side of the bow and I concluded a past owner tripped or fell on the bow while it was unstrung.